Last week I posted about a new press that came into my studio, but I didn’t talk at all about how I paid for it, how I made the decision, or what it means for the future. I don’t talk much about money, and I’m afraid that I might be doing a disservice to folks who want to pursue their own art by giving the topic short shrift. We’ve all heard the adage, “You’ve got to spend money to make money.” In my opinion that’s only half of the story. My version would be, “You’ve got to invest money in things that you have proven can provide a return on the investment and then perform lots of careful actions to manifest that return.” I invested very slowly and carefully to make sure that “failure” would carry as little risk as possible. I started with house paint, then cheap water-based ink. I started with typewriter paper, then card stock, then real, but cheap, printmaking paper. I started with a spoon, then a rolling pin, then a borrowed baren. I started with blocks of scrap wood from a friend’s burn pile and stuck with that for a while. Then, when I was sure that I could technically do what I wanted to, and that I could be happy doing printmaking all day every day, I started on “due diligence”, analyzing the market and the competition. When I had proven to myself that a new business in this arena could succeed, I took a leap and invested in some professional ink and a tiny press to start my way up the steep learning curve of printmaking. I did lots of research into what materials other woodblock printers use, then invested in a better quality wood and shellac. Then I invested in a woodblock printmaking class, an intaglio class, and some private instruction. 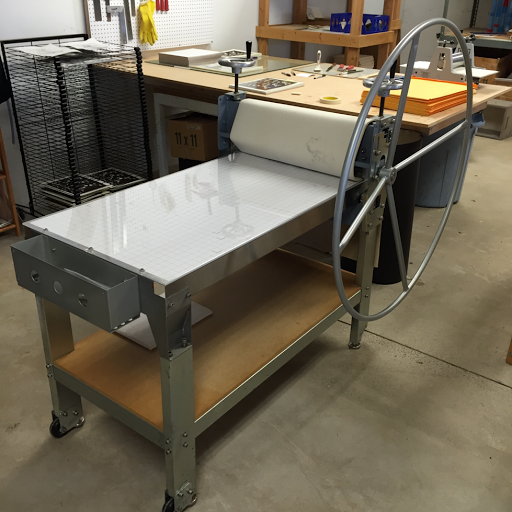 In my time visiting a functioning printmaking studio for classes I got some critical hands-on time with a full-sized press. I immediately returned to my own studio and pulled an edition of 49 prints on my tiny press. There were numerous problems that arose in that project, most of which can be attributed to the difficulty in manipulating a jig, a block, and paper on a press that’s barely large enough for them to fit. So I decided to invest in a larger press. I didn’t have the money, but I was sure of my decision so I put it on a credit card. Yes, I’ll be paying for quite a while, but I’m sure that I can at least sell enough prints in the meantime to cover my interest payments. The principal will have to get covered a little bit later. I knew that the larger press would enable larger work, but there are other benefits that I didn’t really predict. The immediate benefit that I’ve felt from having a larger press has been a greatly improved workflow. There is enough room on the press bed to leave the jig there while I remove the paper, remove, re-ink and replace the block, and add another sheet of paper. Another benefit has been the ease of use. The larger press makes it much easier to set and maintain even pressure. The large wheel gives amazing leverage and greatly reduces the physical work required to pull a print, even at a higher pressure. The end result of these benefits is that I can pull more and better prints and do it faster. These factors are not so important while I’m learning and experimenting, but they will become critical when this business is my bread-and-butter. Faster and easier work means I can work longer hours without tiring and get more finished work (i.e. : income) for my time. So, yes, I over-extended myself to create this opportunity, but in the end this new tool will literally pay for itself and then go on to support me.